Have you ever noticed “some things just go together”? Chocolate and Peanut butter. The stars and the Moon. Coffee and Mornings. All classic pairings. But, how about Human Resources and Marketing? Although not often thought of together, this dynamic duo has been joining forces lately with some encouraging results. Human Resources and Marketing typically remain two separate departments but some modern-day activities are becoming essential to an HR professionals’ role. Let’s take a look. We’re hiring and everyone needs to know! Human Resources has become the ambassador for the recruitment of new talent. In fact, these individuals are influencing employee referrals, posting new jobs online, encouraging employees to recruit on social media, employee background screening, the list goes on and on. Human Resource professionals are using social tools that are must have’s for the Marketing team. Marketing does a wonderful job of promoting their brand and the connection with the product/service that they provide. For Human Resources, this means a promotion of the employee experience. Human Resource professionals are doing a great job of promoting sundae socials, cube decorating contests, great places to work awards, an employee of the month program, just to name a few. These activities are a great way to show the employee experience and can be displayed on sites like Glassdoor, Linkedin, Twitter, Facebook and more! Even more, customer testimonials are essential for marketers to prove that their product is trustworthy. The same can be said for employee reputation. HR professionals must work with star employees to both encourage moral and support a positive reputation. Additionally, job websites such as Indeed and Glassdoor make it easy for employees to give honest employer reviews. In the digital age, every screen is providing a user experience. Marketers worry about website conversion rates and how to provide the best possible user experience. Human Resource professionals are doing the same! A candidate experience during both the recruiting and hiring process can make the difference between winning the war on talent. Factors such as updated job postings, easy-to-use applicant tracking system processes, and mobile capability are all important to a candidate’s application experience. 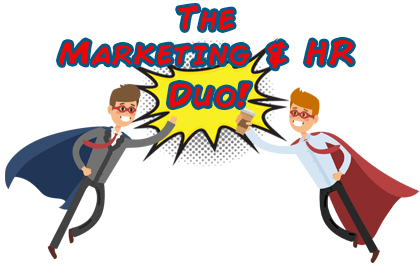 Not only should the Marketing department be thrilled about these Human Resource activities, but when coupled together, will build a very successful recruitment team.